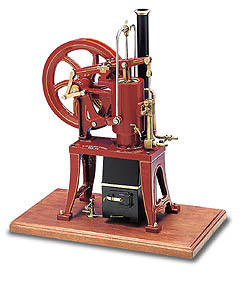 The original machine was patented in America in 1888 and was formally as well as today a classic model among the STIRLING machines. It was used on ranches to fill up animal watering places with water. Our model, a precise copy in the measure 1 : 4, is not only due to its large-scaled method of construction a provocation for the model engineer. approx. 110 r .p. m.
The model is heated by gas.